contains links to pages on this web site relating to the hotel. 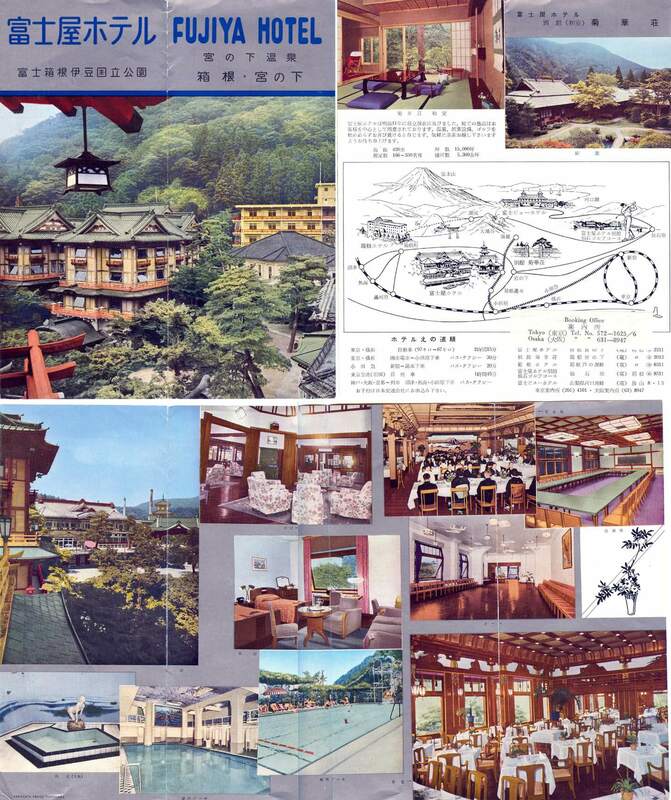 A Brief History of the Fujiya Hotel (Fuji View Hotel). The hotel was founded by Mr. Sennosuke Yamaguchi. Yamaguchi was a delegate on an early Japanese diplomatic mission to the United States and Europe (Iwakura Mission, 1871~1873). Because of this experience, he was determined to create a Western style hotel in the Hakone area catering to the tourist trade. 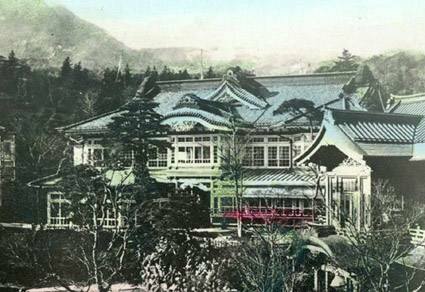 On his return to Japan he purchased an established Japanese inn, the "Fujiya Ryokan" (Wisteria Inn) at Miyanoshita (pronounced "Mee-yan-o-shi-ta") in the Hakone District. This was a large two story Japanese style (non-Victorian) building configured in a "L" shape with two major wings. 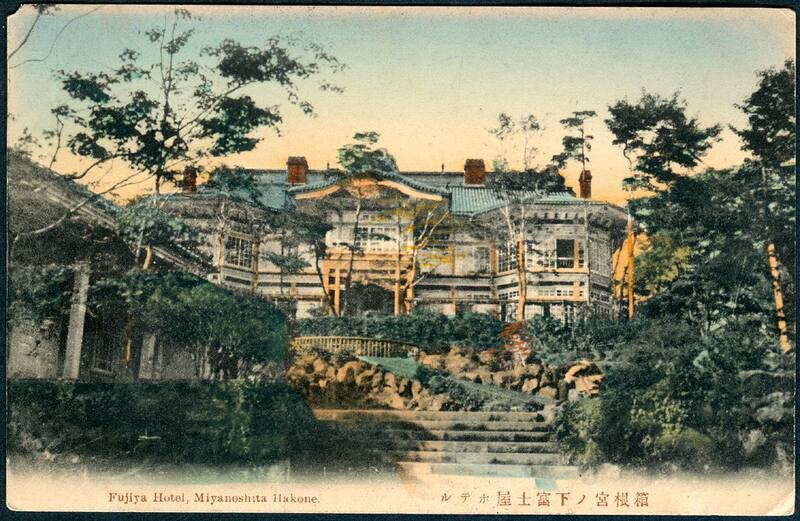 He renamed the Japanese inn the Fujiya Hotel and by 1878 it was catering to foreign tourists. This building was destroyed by fire in December of 1883. By 1885 Yamaguchi had reopened the hotel on an interim basis as a one story Japanese style inn which was know as the Aerie. I believe that this is an early photograph showing that structure. This building remained, at least as late as 1894, even after the new Fujiya Hotel was opened. A single story building called the "Eyrie" is shown in a ca 1964 sketch map and this is probably the Aerie. 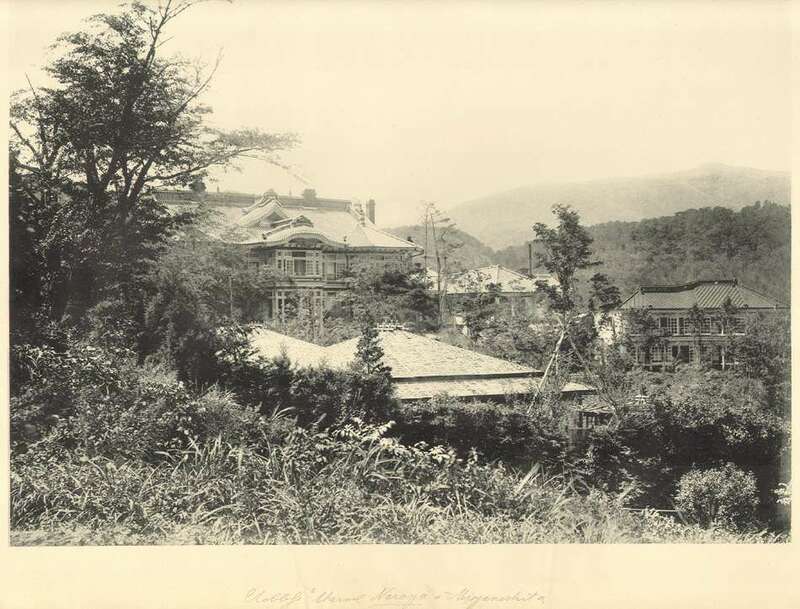 Although the details are not clear, sometime between 1878 and 1883, Yamaguchi began construction of a grand replacement for the Japanese inn buildings using the Victorian style of architecture that was developing in the treaty ports. His architect was Heijiro Kawahara. While the new hotel was still under construction, it was destroyed by fire in 1883. 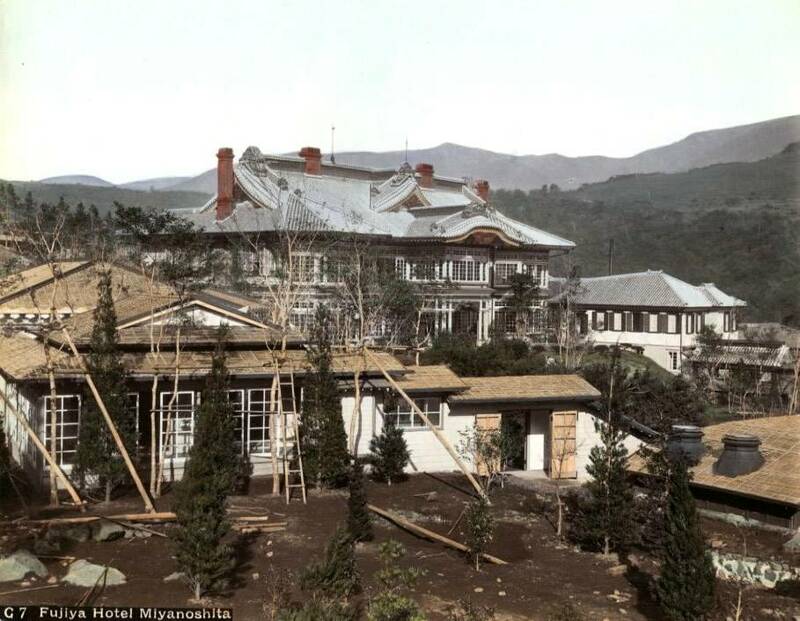 Construction restarted in 1884 and by 1891 the main building of the new Fujiya Hotel was completed. 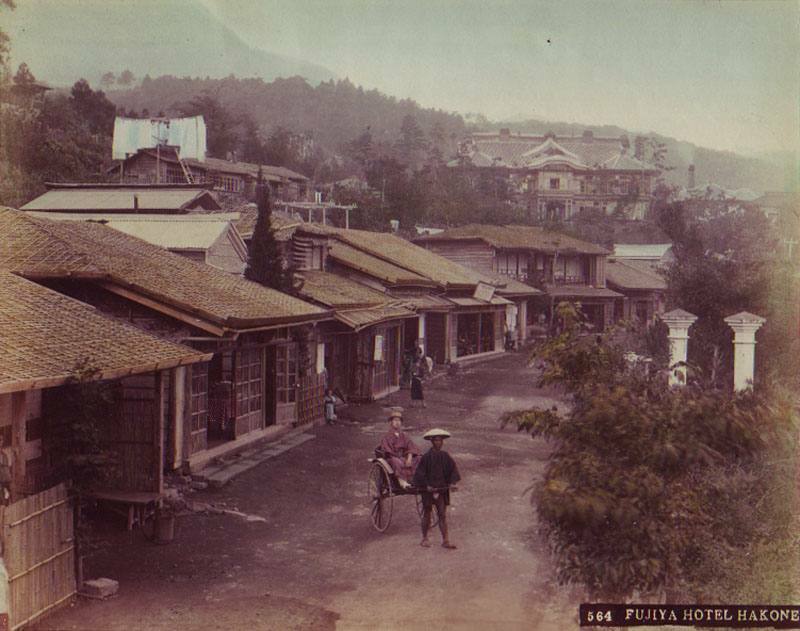 In many photographs of the 1891 Fujiya Hotel a two story Western style building is seen to the right of the front of the hotel. This building was apparently completed in 1886, before the main building. It later came to be know as the Hermitage. The main building was distinguished by its Western construction combined with a tile roof and Japanese style gables. Basil Chamberlain Hall moved into the hotel ca. 1891 and resided there for 20 years. While the hotel advertises that it was founded in 1878, it appears very unlikely that guests were regularly accommodated in the main Western style hotel building until 1891. In 1893 the hotel was incorporated under the Japanese Commercial Code under the name Fujiya Hotel Co. Ltd. Sennosuke Yamaguchi died in 1915. His son, Shuichiro Yamaguchi, then assumed the presidency of the corporation. The hotel came under the management of H.S.K. Yamaguchi (1882-1944), the founder's son in law, around 1907 and remained so until his death in 1944 when the management passed to his son in law, K.M. Yamaguchi. During H.S.K. Yamaguchi's tenure you often see him listed as the "President" and K.M. Yamaguchi listed as the "Managing Director." Also, you find the hotel described as under the "personal management" of S. Kanaya, H.S.K. Yamaguchi's brother. In 1906 two Victorian style cottages (Comfy Lodge and Restful Cottage) were added. The hotel complex was severely damaged in the great earthquake of 1923. By 1930 the complex was rebuilt/restored and an annex added. A large sun porch was added to the front of the main building during this reconstruction phase (1923-1930). The new building, know as "The Annex" contained a dining room, the "Dream Pool," a bar and billiard room and a shopping arcade. The dining room was finished in teak and contained 159 ceiling panels with paintings and 41 separate wood carvings. In total the ceiling panels featured 636 birds, 507 flowers and 238 butterflies and moths. In 1936 construction was completed on another building in the Fujiya complex which was named the Flower Palace. This was considered to be the "deluxe wing" of the Fujiya Hotel. With the completion of the Flower Palace, the hotel complex had a total of 151 guest rooms which could accommodate 260 guests. This has remained relatively constant over the years and the hotel currently advertises that it "...accommodates a maximum of 300 guests in 146 western style guest rooms at the 5 hotel houses (Main Building, Comfy Lodge, Restful Cottage, Flower Palace and Forest Lodge." 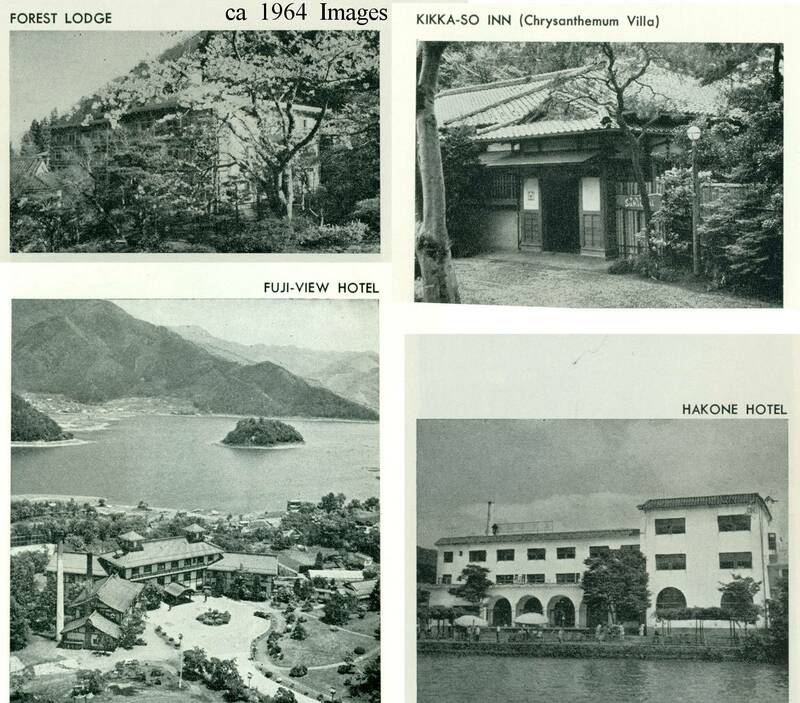 The Fujiya View Hotel on Lake Hakone was also built in 1936. 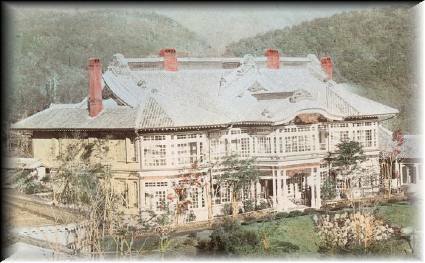 After World War II, the hotel purchased the Imperial villa in Miyanoshita and opened it as the Kikka-So. On a hill in the Kikka-so's Japanese garden is a one room house, the Reiju-an, used exclusively for the tea ceremony. Shortly after the War ended the hotel complex came under US Army control and served extensively as a "Rest and Relaxation" (R&R) facility for occupation forces. 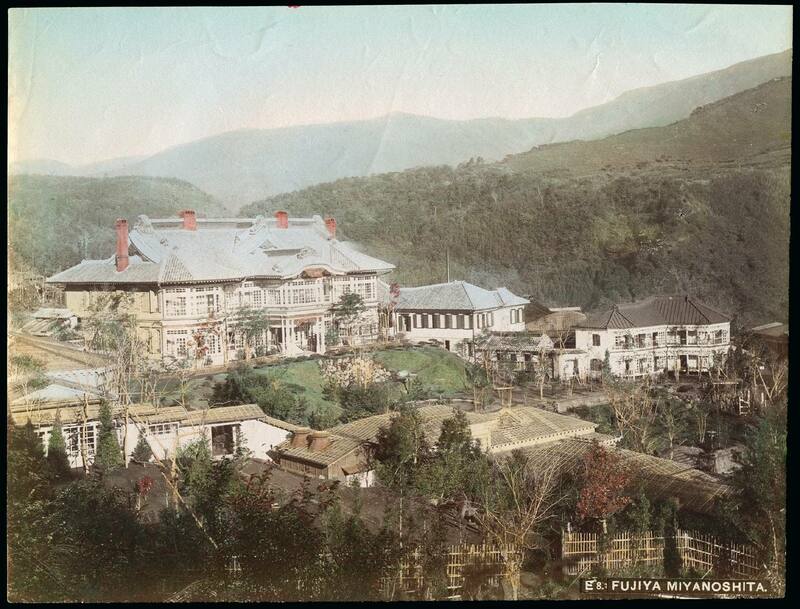 The Fujiya Hotel was released from Army control in 1954 and the Fuji-View in 1958. The hotel complex underwent significant reconstruction in the 1960s. The Forest Lodge, a four story building with 45 guest rooms and two conference facilities ("Forest Rooms"), was added to the hotel complex in 1960. Throughout the years, the hotel successfully made the experience more informed and efficient by publishing English language guides, railway time tables and maps for the visitor. 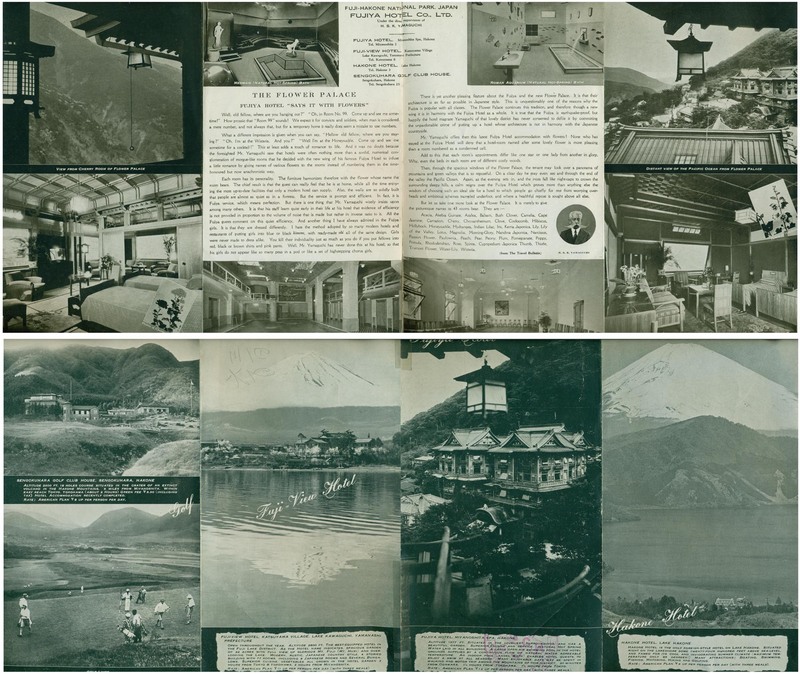 The hotel also published English language books with the intent of informing the foreign visitor on Japanese culture, customs and geography. These books were titled We Japanese and M.S.K Yamaguchi was the moving force behind them. By 1949 the publication had expanded to a three volume book set. This material is discussed below. In July of 1917 the hotel opened the fourth golf course built in Japan. It was a 7 hole course. In 1935 it was expanded into an 18 hole course and by 1937 the golf club house was completed. A ca 1932 hotel map and guide and a ca 1934 hotel flyer both note a 9 hole golf course. This must have been the situation as the hotel transitioned from the 7 hole course to the 18 hole course. In the mid-1930s the hotel operated "The Fujiya Motor Service" or "The Fujiya Automobile Garage" with the head office in Miyanoshita. Hotel flyers boasted of 120 (Motor Service) or 170 (Automobile Garage) "high grade six passenger cars, each driven by an experienced chauffeur..." available for hire. This service also operated the Fujiya Buses. Currently the hotel complex consists of 5 major hotel buildings; the Main Building, Comfy Lodge, Restful Cottage, Flower Palace and the Forest Lodge. The Comfy Lodge and Restful Cottage are know collectively as the "Seiyoka" and Heijiro Kawahara was the architect on these buildings as well as the main building. 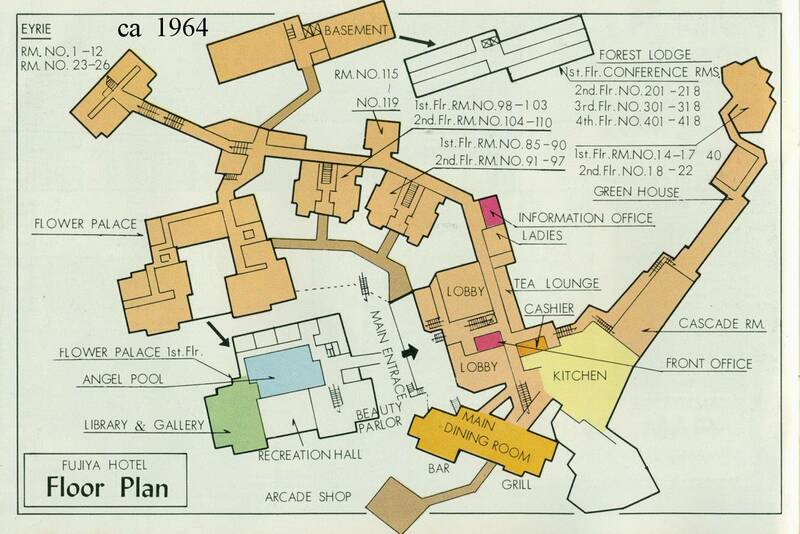 To see a ca 1964 sketch map ("Pictorial Map") of the Fujiya Hotel complex, click here. A ca 1964 "floor plan" of the hotel complex is here. and Fujiya Hotel Golf Course, Segoku, Hakone. The Fuji-View Hotel, Katsuyama, Lake Kawaguchi, H.S.K. Yamaguchi, Managing Director. The Hakone Hotel, Lake Hakone, Hakone-Machi, H.S.K. Yamaguchi, Managing Director. 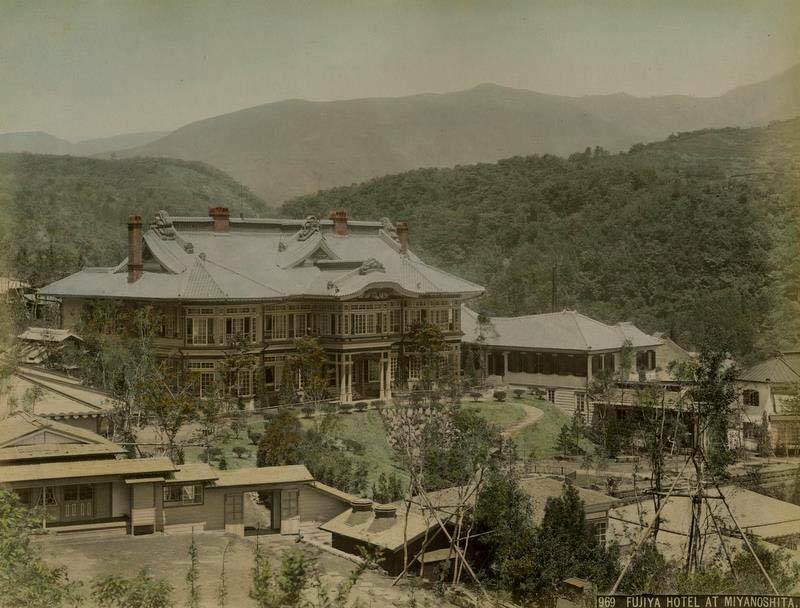 The Nikko-Kanaya Hotel, Nikko, operated by S. Kanaya, brother of H.S.K. Yamaguchi. 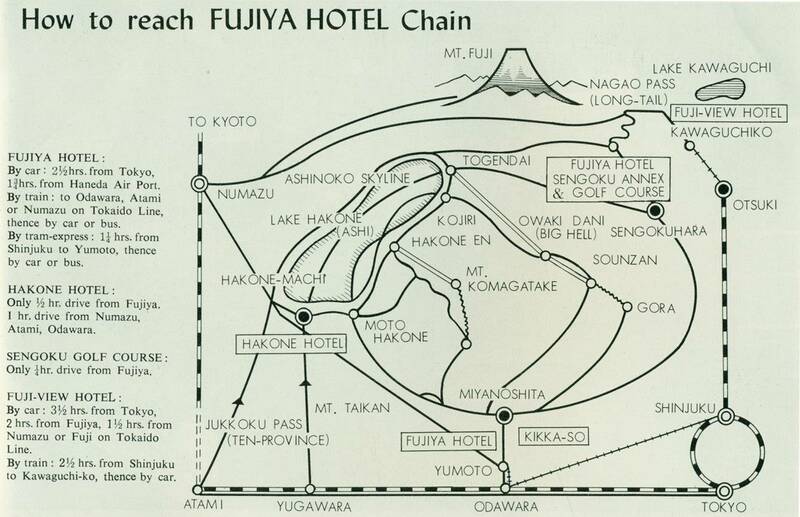 To see a ca 1964 sketch map of the Fujiya family of hotels and adjacent area, click here. In addition many many famous guests such as the then-Crown Prince Hirohito, Archduke Franz Ferdinand of Austria, Albert Einstein, General Dwight Eisenhower, John Lennon, Yoko Ono, and Basil Hall Chamberlain, who was a permanent resident of the hotel for 20 years, the hotel is noted in particular for one infamaous guest. Josef Albert Meisinger, a member of the German Sicherheitsdienst (intelligence service), was arrested at the Fujiya Hotel on September 6, 1945 by American forces. He had been serving with the Germany Embassy in Tokyo. Information on Meisinger can be found here. 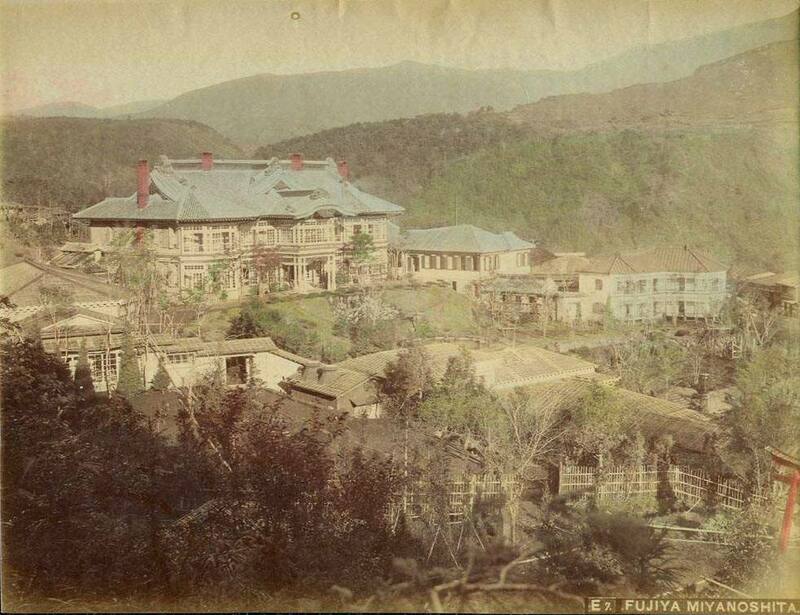 Albumen Photograph, c1890, Large (8 x 10 in) Tourist Trade Photograph "414" (showing old Fujiya Hotel). 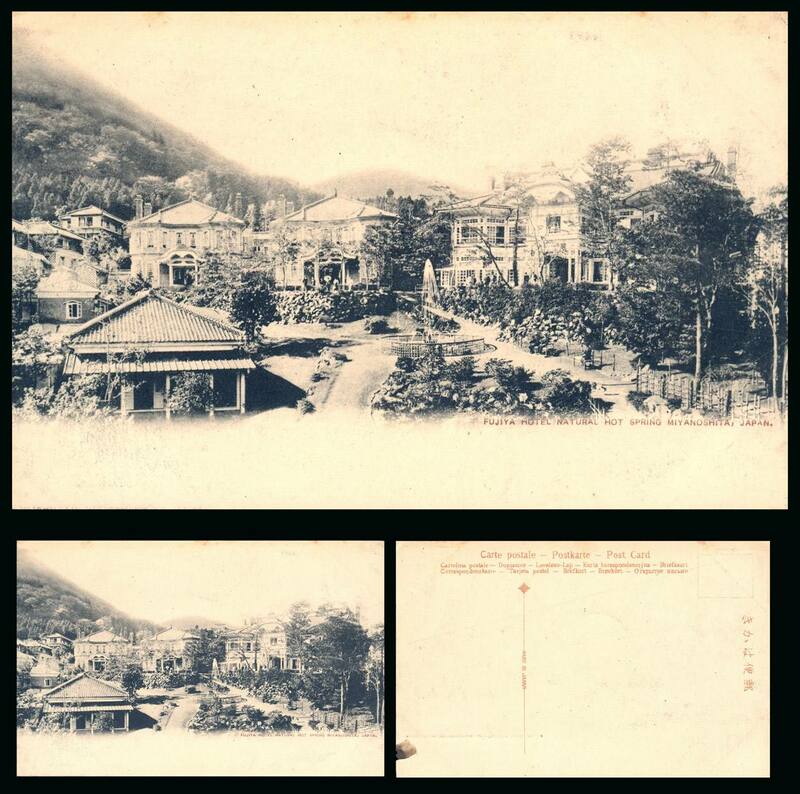 Albumen Photograph, c1890, Large (8 x 10 in) Tourist Trade Photograph "963" (showing old Fujiya Hotel - same image as above). 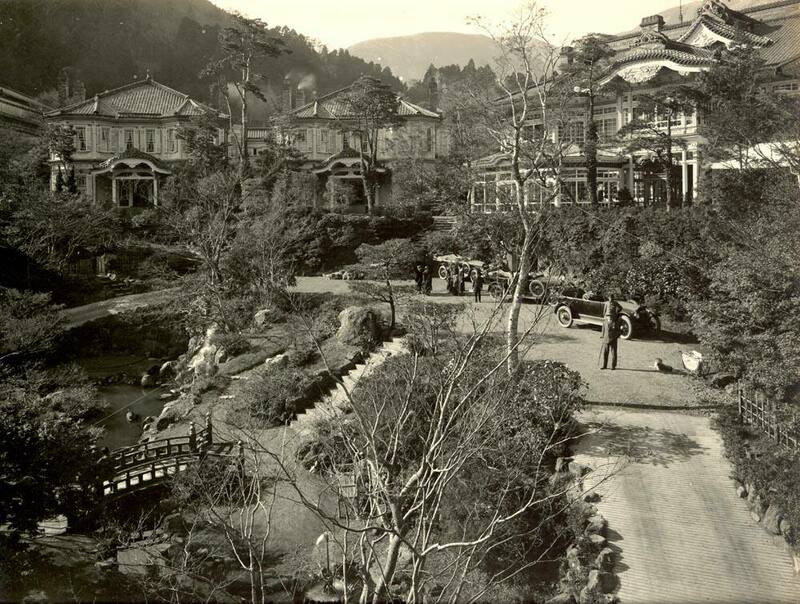 Albumen Photograph, c1890, Large (8 x 10 in) Tourist Trade Photograph "967" (showing old Fujiya Hotel when located in the Japanese style structure known as the "Aerie"). The same photograph exists with the title "Japanese Room of Fujiya Hotel, Miyanoshita." 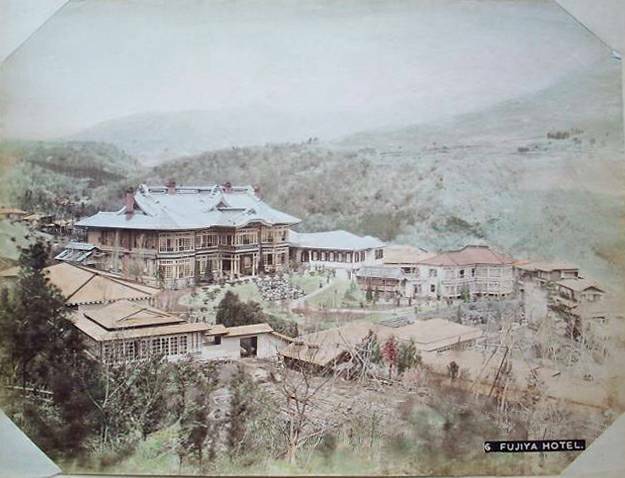 Albumen Photograph, c1890, Small (3 1/2 x 5 1/4 in) Tourist Trade Photograph (showing old Fujiya Hotel when located in the Japanese style structure known as the "Aerie"). Very similar to above photograph. 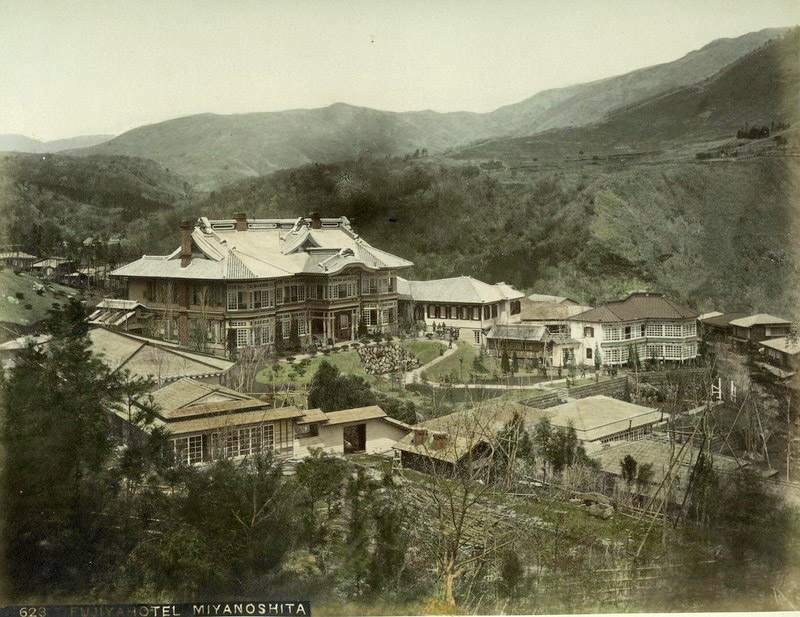 c1891, construction completed on the main building of the new Western style Fujiya Hotel. 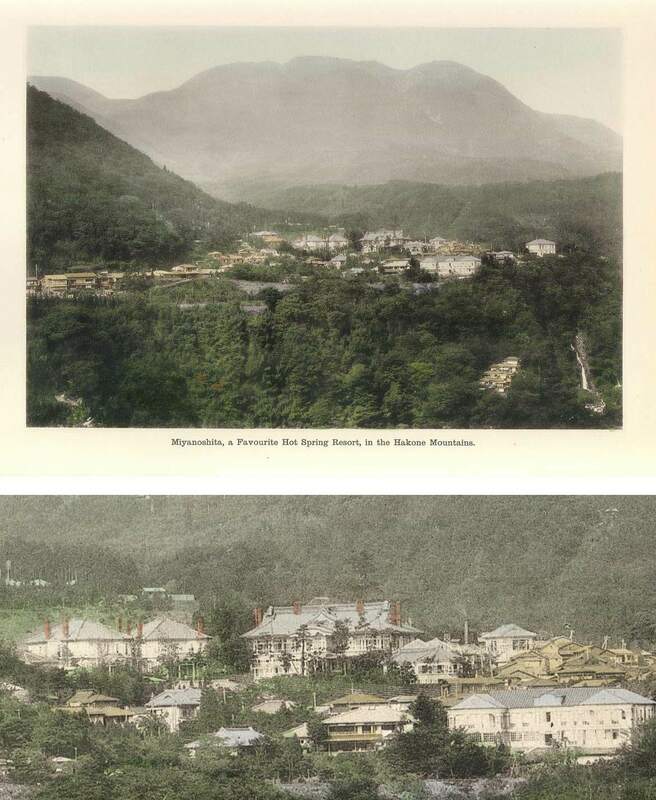 Collotype Reproduced Photographs, 1892, K. Ogawa, The Hakone District, Illustrated by K. Ogawa, Photographer, in Collotype With Descriptive Text by James Murdoch, M.A., Plates II and III of this important photographic record of the Hakone district show pictures of "Naray's Hotel, Miyanoshita." The view in plate III has the characteristics of the main building of the Fujiya Hotel. If this is the case, this image could be one of the earliest images of the hotel (completed in 1891) that was mass produced via a photomechanical process. 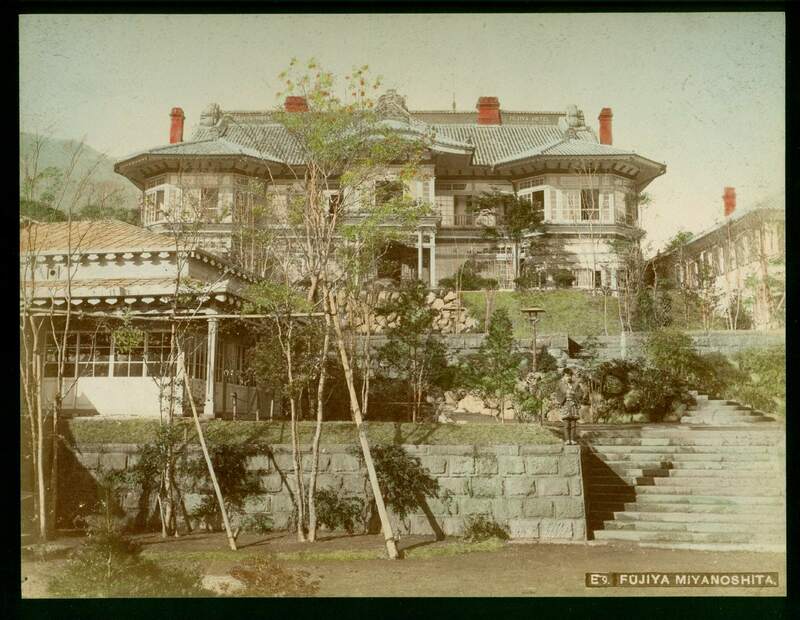 Albumen Photograph, c1897, Large (8 x 10 in) Tourist Trade Photograph "6 Fujiya Hotel" by K. Tamamura, Yokohama & Kobe. 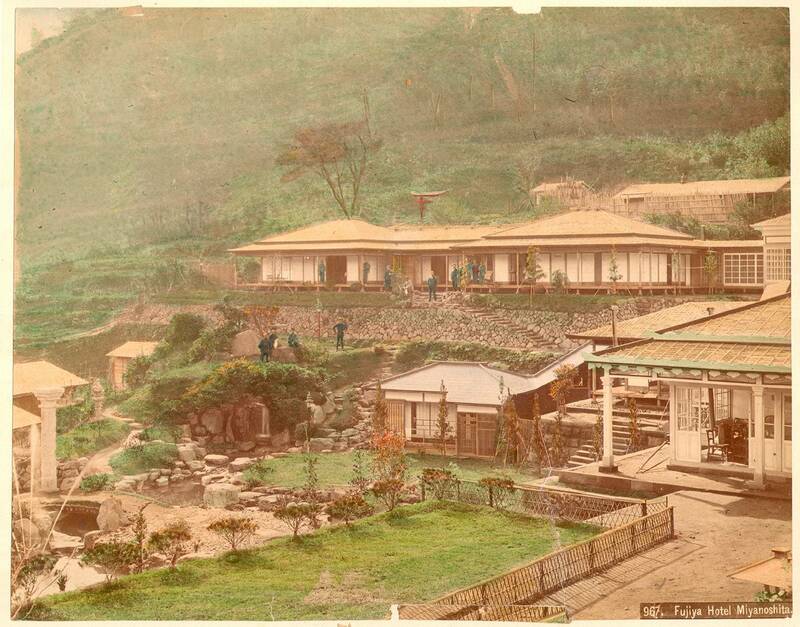 Albumen Photograph, c1897, Large (8 x 10 in) Tourist Trade Photograph "E6 View of Miyanoshita, Hakone" (showing Fujiya Hotel). Albumen Photograph, c1897, Large (8 x 10 in) Tourist Trade Photograph "E7 Fujiya Miyanoshita." Albumen Photograph, c1897, Large (8 x 10 in) Tourist Trade Photograph "E8 Fujiya Miyanoshita." Albumen Photograph, c1897, Large (8 x 10 in) Tourist Trade Photograph "E9 Fujiya Miyanoshita." 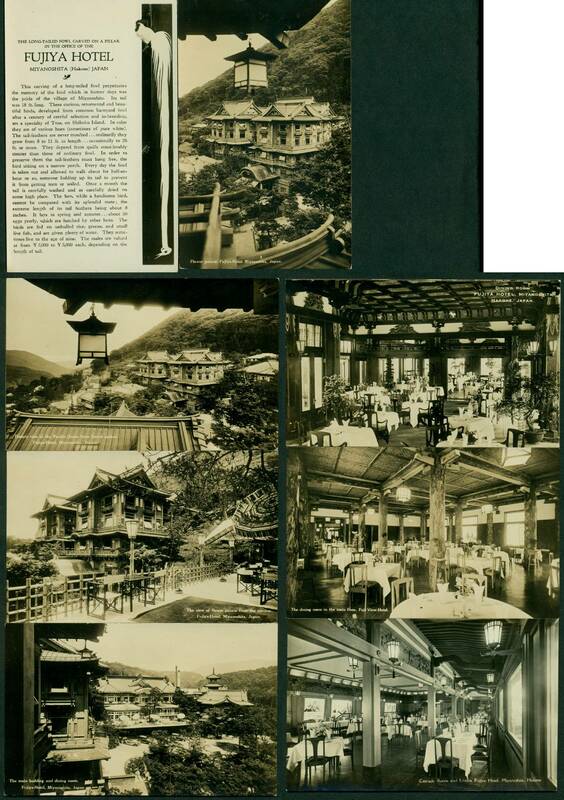 Albumen Photograph, c1897, Large (8 x 10 in) Tourist Trade Photograph "G7 Fujiya Hotel Miyanoshita." 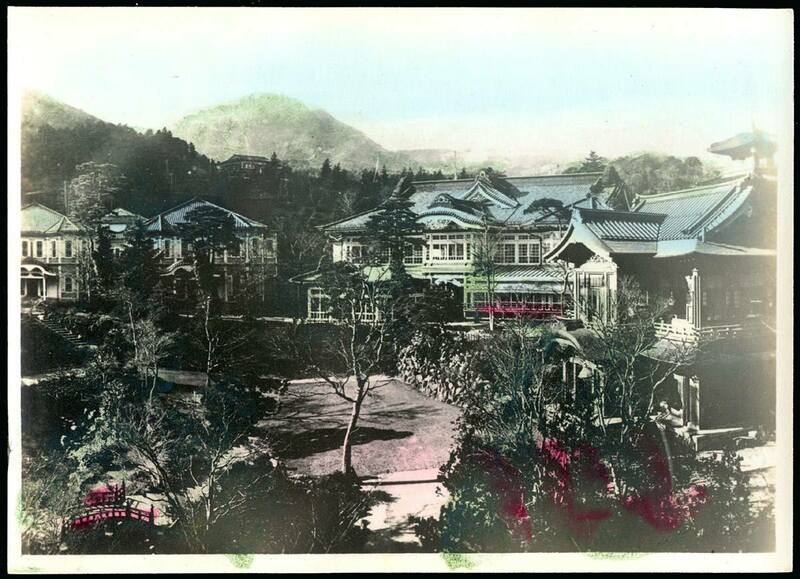 Albumen Photograph, c1897, Large (8 x 10 in) Tourist Trade Photograph "A65 Fujiya Hotel, Miyanoshita, Hakone". 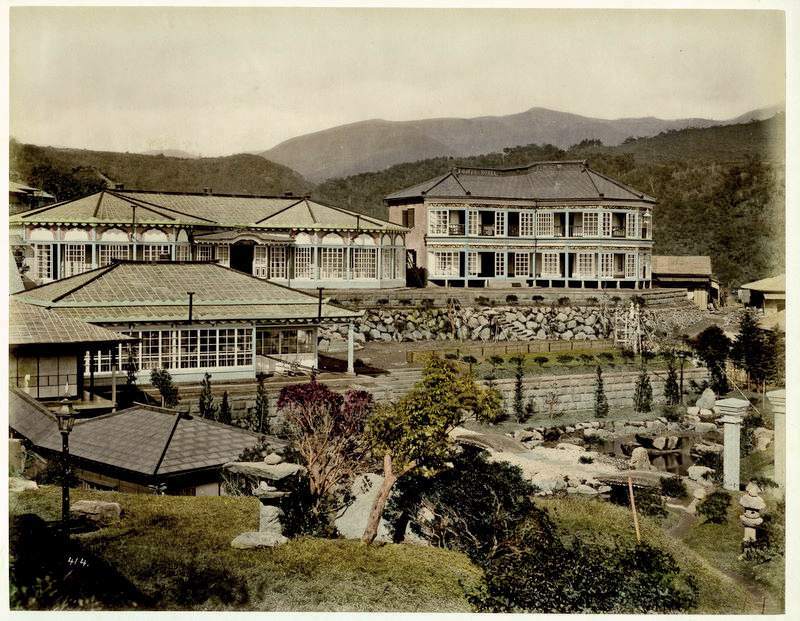 Albumen Photograph, c1897, Large (8 x 10 in) Tourist Trade Photograph "564 Fujiya Hotel Hakone" by Reiji Esaki. Albumen Photograph, c1897, Large (8 x 10 in) Tourist Trade Photograph "623 Fujiya Hotel Miyanoshita" by Tamamura Kozaburo. 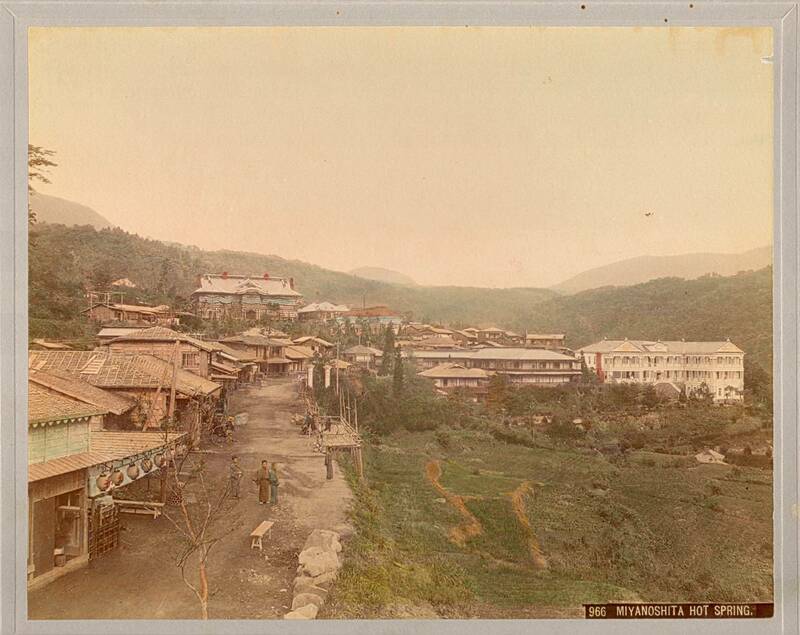 Albumen Photograph, c1897, Large (8 x 10 in) Tourist Trade Photograph "966 Miyanoshita Hot Springs" with Fujiya Hotel in the background at the left, by Kusakabe Kimbei. Albumen Photograph, c1897, Large (8 x 10 in) Tourist Trade Photograph "969 Fujiya Hotel at Miyanoshita" by Kusakabe Kimbei. Guide Book, 1897, Notes For Tourists to Miyanoshita and the Immediate Vicinity With Complete Time Tables of Railway in Japan, Fujiya Hotel, Hakone, Japan, 1897 (Available, click here). Guide Book, 1898, Notes For Tourists to Miyanoshita and the Immediate Vicinity With Complete Time Tables of Railway in Japan, Fujiya Hotel, Hakone, Japan, 1897 (Available, click here)..
Picture Post Card, c1900, Hand Tinted (color added) Collotype Picture Post Card "Fujiya Hotel, Miyanoshita Hakone." Guide Book, 1903 & 1904, Notes For Tourists to Miyanoshita and the Immediate Vicinity, Fujiya Hotel, Miyanoshita, 1903 & 1904 Editions (Available - 1904 Edition, click here. 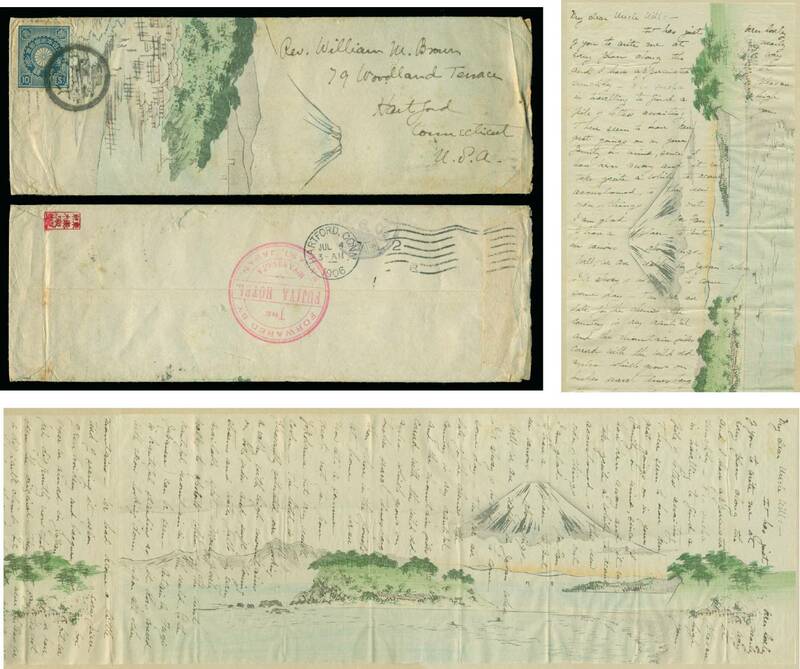 Fujiya Hotel Forwarding Handstamp, 1906, letter to Connecticut, June 1906, with hotel "Forwarded by the Fujiya Hotel" circular handstamp. Envelope with color illustration of Mt Fuji. Contents 72 inches long with repeating color illustrations of Mt. Fuji. 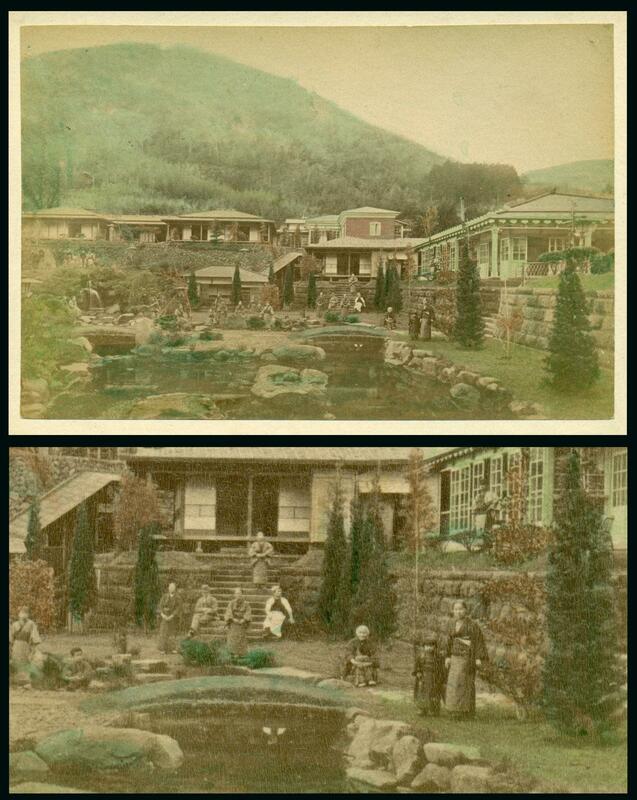 Color Collotype Print, c1906, found in Sights & Scenes in Fair Japan by K. Ogawa, titled "Miyanoshita, a Favorite Hot Spring Resort, in Hakone Mountains." (Available, click here). 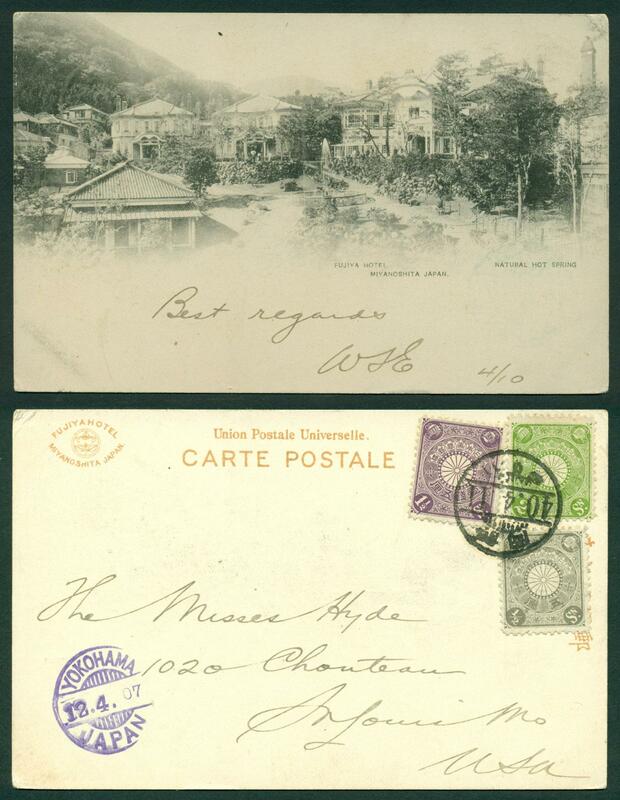 Picture Post Card, 1907, Collotype Picture Post Card, "Fujiya Hotel, Miyanoshita, Japan." 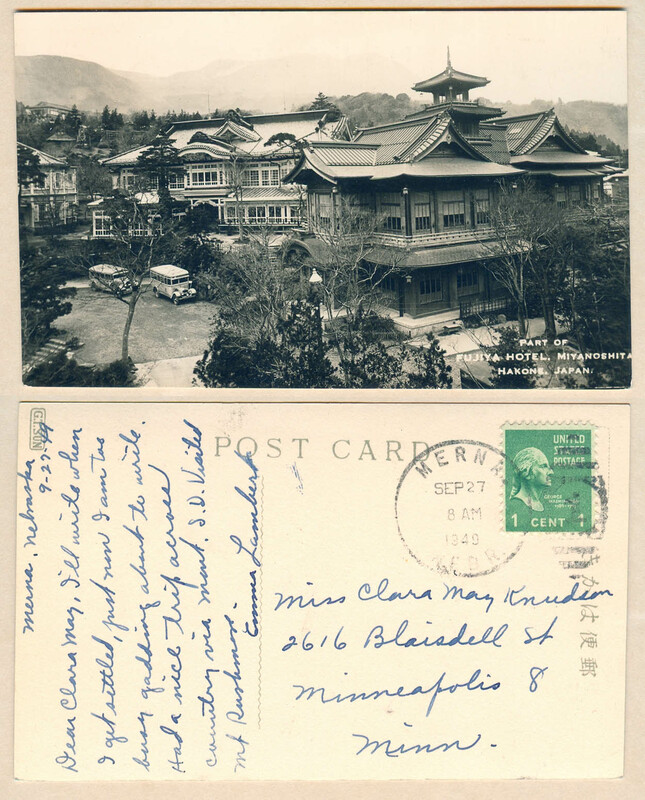 Picture Post Card, 1908, Collotype Picture Post Card, "Fujiya Hotel, Miyanoshita, Japan." Guide Book, c1910, Notes For Tourists to Miyanoshita and the Immediate Vicinity, Fujiya Hotel, Miyanoshita (Available - c1910 Edition, click here. 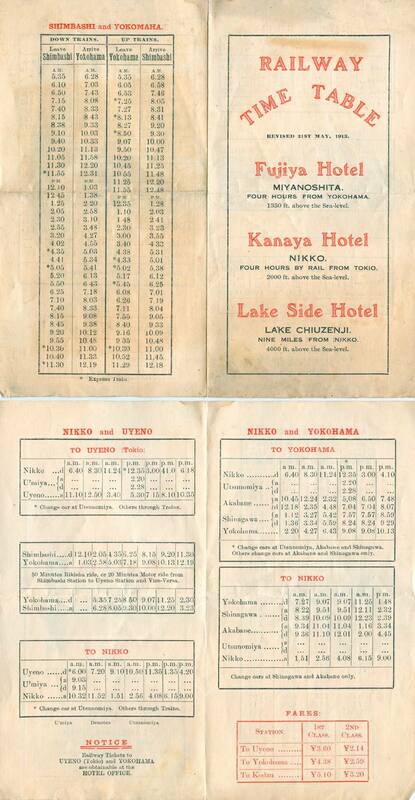 Railway Time Table, 1913, Railway Time Table, Revised 21st May, 1913, Fijiya Hotel, Miyanoshita, Kanaya Hotel, Nikko and Lake Side Hotel, Nine Miles from Nikko. 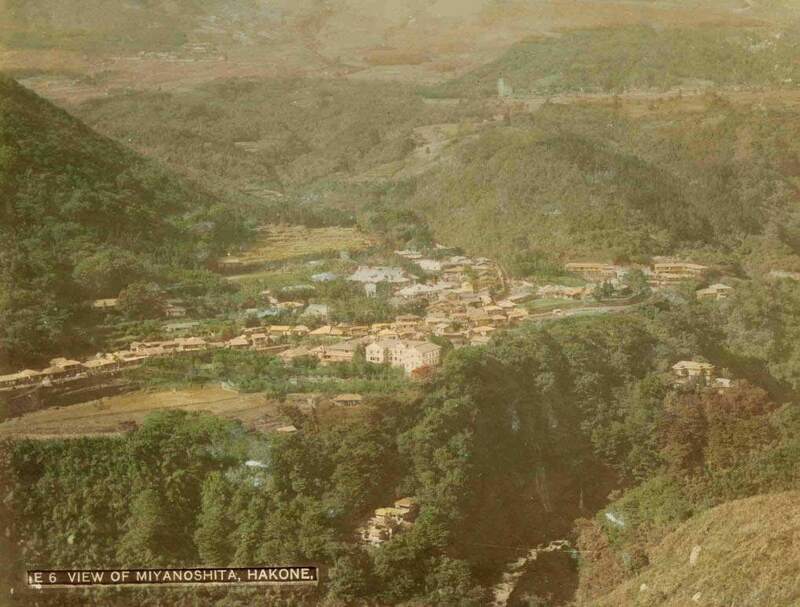 Picture Post Card, c1915, Hand Tinted (color added) Collotype Picture Post Card, "Fujiya Hotel Natural Hot Spring Miyanoshita, Japan." Guide Book, c1920, Fujiya Hotel, Miyanoshita, Japan, Type I (Guide Book). (Available - Type Ib, click here. Guide Book, c1920, Fujiya Hotel, Type II (Guide Book) (Available, click here, here and here). Photograph, c1920, Fujiya Hotel Photograph. Picture Post Card, 1929, Picture Post Card (collotype, hand tinted - image transposed) postmarked March of 1929. 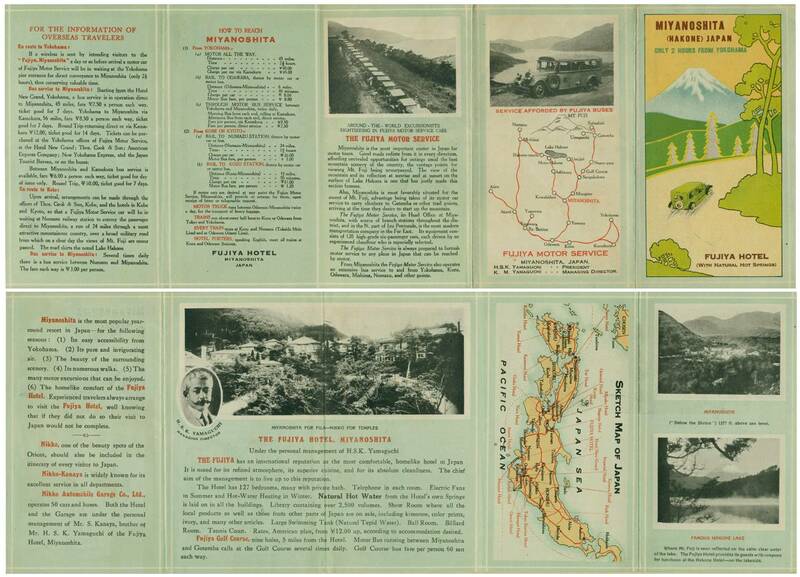 Hotel Brochure, c1932, Map and Guide. Hotel Brochure, c1932, Hotel Flyer. Hotel Handout, c1934, Hotel Flyer (similar to but slightly different from above). 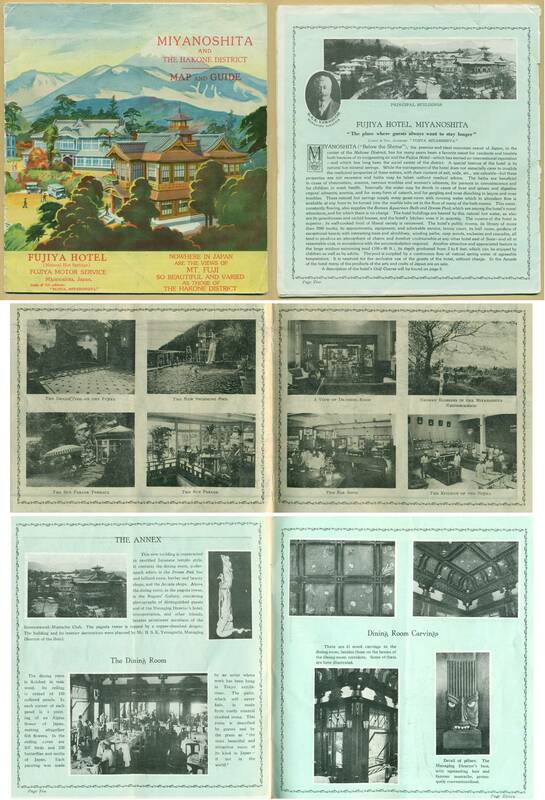 Commemorative Booklet, 1936, Commemorating Completion of The Flower Palace, Fujiya Hotel, 1936 (Available, click here). 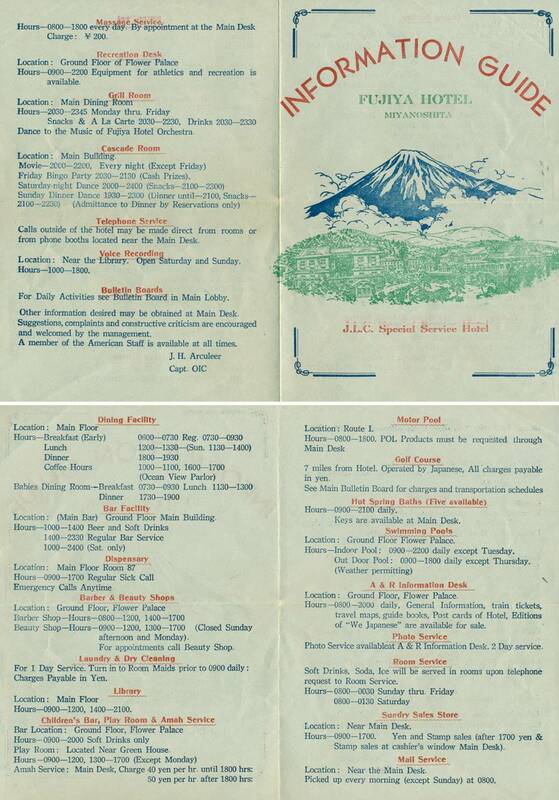 Hotel Brochure, c1936, Hotel Flyer. Picture Post Card, c1938, Real Picture Post Card, Flower Palace. 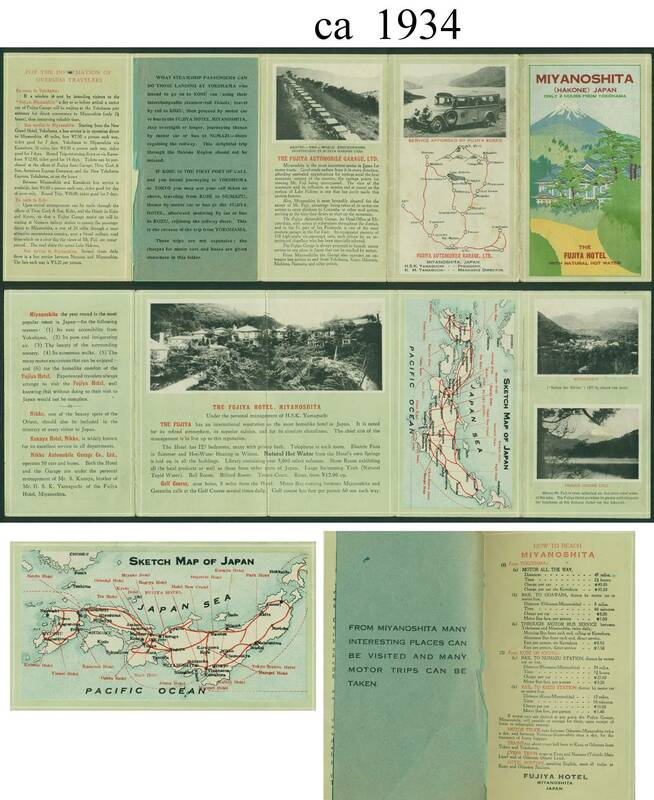 Folding Map & Brochure, 1940, Pictorial Guide of Fuji-Hakone National Park, Published by Fujiya Hotel Co..
Real Picture Post Cards, c1940, Set of 8 Picture Post Cards. Set of Small Commercial Photographs, c1940, small hand tinted bromide photograph set (16 photos) of the hotel (Available, click here). 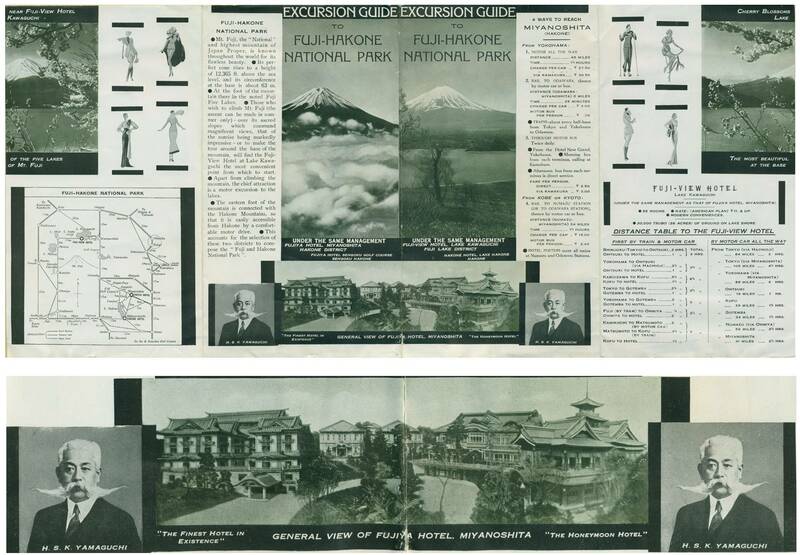 Hotel Folder, c1944, Excursion Guide to Fuji-Hakone National Park (large folding sheet [47 x 52 cm] printed both sides). Hotel Brochure, c1944, Hotel Flyer. Hotel Flyer, c1948, Information Guide, J.L.C. Special Service Hotel. Picture Post Card, c1949, Real Picture Post Card. Set of Small Commercial Photographs, c1950, ten different photographs (Available, click here). Picture Post Card Set, c1950, eleven different color half-tone post cards. Hotel Brochure & Room Rate Chart, c1955. Picture Post Card Set, c1960, sixteen different color half-tone post cards. Hotel Brochure, c1964, Hotel Brochure/Booklet (Available, click here). 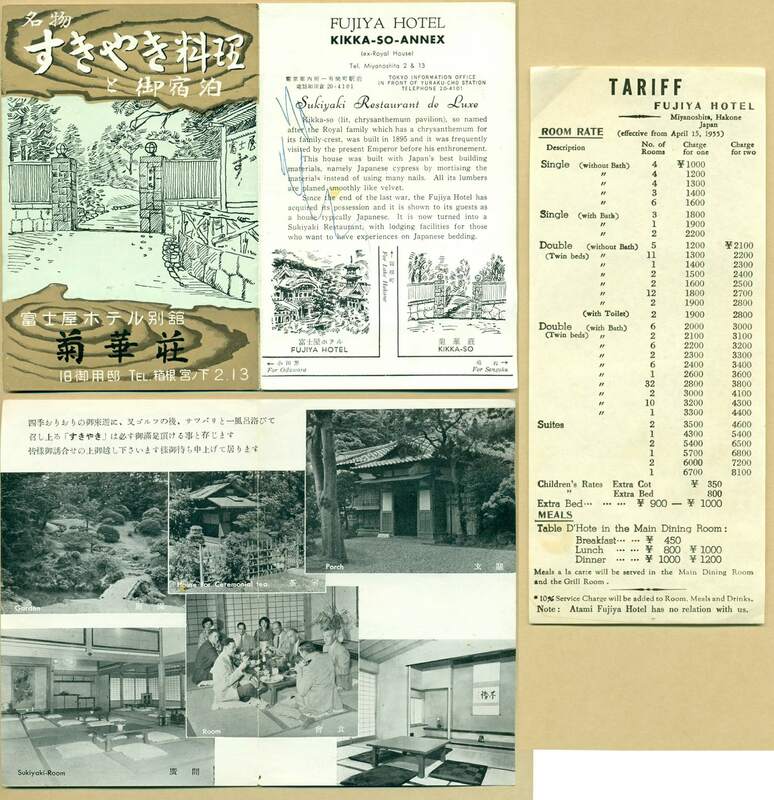 Hotel Handout, c1965, Hotel Flyer (Japanese Language). We Japanese, books, 1934 forward (numerous printings), eventually expand to a three volume set (1949). Latest printing confirmed thus far is 1964. For a current satellite view of the Fujiya Hotel, you can visit this WikiMapia: Japan web page.